Can you imagine never being able to eat again? Hooking up to IV nutrition or tube feedings every day in order to live? 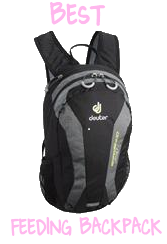 Carrying your nutrition on your back all day or being attached to a pole all night? Or, simply having to “survive” on chicken broth, Ensure, and small bites of food all day long? And in spite of that, still dealing with malnutrition, dehydration, weight loss, abdominal pain, nausea, and vomiting on a daily basis? Frequent trips to the ER and hospital become routine…just a part of life. Social activities are non-existent because most of them involve food. If you do go out, you end up ordering water, maybe a soda, and pulling that pack of crackers out of your purse to nibble at. You feel fortunate that you are even capable of keeping that down, realizing that many people in similar situations can’t. Making plans is a challenge. You may feel well and up for an outing, but then while out the symptoms attack and a planned fun-filled evening becomes a drag very quickly. That’s what life with gastroparesis and intestinal pseudo-obstruction is like. These conditions are so poorly understood. They are so hidden that people often don’t believe they are real or are not as serious as they actually are. Although difficult to understand, patients suffering from GP and CIP may look completely healthy. They may drive, work, shop, go to church, take care of a family, and look great on the outside. Their color may be nice, they may look strong and energetic, and they may appear to be feeling well. Yet, the turmoil churning within them is by no means normal. Remember the last time you had the flu. After 24 hours of nausea, vomiting, perhaps diarrhea, and aches and pains, you couldn’t wait to get back to work and your normal activities. As you tried to return to your routine activities, however, you did notice you felt weaker than usual. It was more challenging to get things done because you had a day of surviving on toast, crackers, and soup…not exactly a champions dinner! Now, take that day and multiply it by years. Add medication, medical procedures, hospitalizations, chronic malnutrition complications, invasive treatments, surgeries, and additional illnesses that develop over time. You are getting closer to understanding what life with GP and CIP is like, but you are still not there. On top of the physical issues, because the conditions are so poorly understood, people with GP and CIP often have to live with the challenges of stereotyping by society. It is often believed that patients are exaggerating their conditions because they don’t “look sick.” Others believe those who suffer really just have an eating disorder and use a “mild” condition as an excuse for not eating well. People simply don’t understand that a couple sips of soup can send one’s gut into a frenzy and result in hours of nausea, abdominal pain, and vomiting. Sometimes this lasts even for days. One wrong bite of food can result in a bowel obstruction and trip to the hospital for an NG tube for suction or surgery to remove the blockage. There are no cold and flu treatments to help symptoms or treat the conditions at all. At best, patients can try some anti-nausea medications with nasty side effects, or drugs that are so expensive insurance companies only provide 12 a month…so they have to decide which 12 times a month they are sick enough to take it. On top of that, any drugs that may help are pulled from the market and no longer available. Once that is removed, even if restarted through compassionate clearance programs, they never quite work as well again. But the odds of getting on that program are slim to none. They feel like everything has been taken away from them…not only health, a normal life, food, and even friends and family who jump ship, but the only treatment that keeps them even somewhat functioning. Think back again to the day you had the flu. You probably did not want to lift your head off the bed or couch. You felt too weak to make it to the bathroom. Every time you sat up, you felt your head spin and the nausea increased even more. Finally, it was a battle of determination to force yourself up and walk to distance to the bathroom. While you were up, you tried to grab as many items as you needed so you didn’t have to get back up again for a long time. By the time you get back to bed, you were so weak and wiped out that all you wanted to do is sleep or watch TV. But you couldn’t get your mind off the nausea. It was so overwhelming that you curled up into a ball on your side and just waited for it to pass. You took flu medication in hopes of sleeping it off and had hope that tomorrow would be better. There are also many situations in which living with GP and CIP are no longer an option. In severe cases, chronic malnutrition takes over and people are unable to survive the trauma on the body. The body often quits absorbing, organs shut down, and the liver may fail for those who have been on long term IV nutrition. Veins become inaccessible and there is no way for them to receive nutrition. Some who are fortunate enough to be aware of the option and be eligible may pursue a five organ transplant as a last resort to stay alive. While this can be miraculous and life saving, it doesn’t come without its own complications for life. Individuals who reach this level of severity have become desperate. There are no options. They either risk their lives by going through a transplant, recognizing that even if they make it to the transplant and out of the OR, they face a lifetime of complications and possible organ rejection. But the only other option is starvation. There’s not really a choice when you get to that point. Living with GP and CIP is hard to describe. The best patients can do to help others understand is to tell people to consider what it would feel like to have the flu, every single day, and the impact that would have on your life. But then you have to throw in additional health problems and the stereotypes, comments, and claims by others that what they deal with is not real and not worthy of attention. Because they don’t “look” sick, family and friends who don’t believe put a wedge between them or completely leave, believing that the person is trying to use a mild condition to “benefit” from resources such as disability, have an excuse to get out of unwanted duties, a way to receive special parking “privileges,” and other accommodations at work and school. They are often looked at oddly when forced to admit they are on disability because of a “stomach” problem, can’t lift a box of sodas into their cars because they are too weak, get glared at because they park in an HP spot but get out of the car walking, and dealing with other colleagues and students who are jealous of the accommodations received to make life easier to live and adaptation into society easier. GP and CIP need more attention. People don’t understand what it is really like to fight these conditions and what daily life is like for those who suffer. They are downplayed as simply being conditions that can be controlled if “you would just eat correctly and avoid certain foods.” While in some instances this is true, there is a very wide spectrum to the level that people die from these conditions as well. If not to the point of dying physically, many are unable to truly “live” at all as GP and CIP zaps the life out of them. Note how long it took you to recover from just a 24 hour flu. Then realize that in GP and CIP there is no recovery. There is no in between. It is a daily battle, with ups and downs, unknowns, and a life full of complexity and misunderstanding. Try to step into their shoes for a short time. Next time you have your head in the toilet, imagine life like that every day. Be thankful for what you have. Be thankful you will recover and life will return to normal. And remember those whose lives will never return to normal. Give back. Help them fight. Support them. Try to understand. Let them vent without judging them. Encourage them. They often lack self-confidence because they have either been judged so much or feel as if they are incapable of accomplishing important things because of being ill. Also, realize that you are dealing with some of the strongest, toughest, people you will ever meet. Thank you for taking the time to read this and step into the lives of those suffering from GP and CIP for a short time. Gastroparesis, also called delayed gastric emptying, is a medical condition consisting of a paresis (partial paralysis) of the stomach, resulting in food remaining in the stomach for a longer period of time than normal. Normally, the stomach contracts to move food down into the small intestine for digestion. The vagus nerve controls these contractions. Gastroparesis may occur when the vagus nerve is damaged and the muscles of the stomach and intestines do not work normally. Food then moves slowly or stops moving through the digestive tract. Causes of gastroparesis vary between each individual patient just as the symptoms vary. However, it is hypothesized that damage to the main nerve controlling stomach function (vagus nerve) causes most cases of gastroparesis. Damage can be from the common virus, abdominal surgery and diabetes. 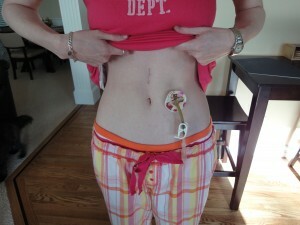 Sometimes the cause of gastroparesis is never determined and this is called idiopathic gastroparesis. A nuclear medical test called a gastric emptying study, the golden standard for diagnosing gastroparesis. * My personal experience with all types of treatments can be found here. Because the cause of gastroparesis is often unidentified, treatment aims more at controlling symptoms, rather than curing the problem. Treatments come in all forms such as diet changes/restrictions, medications, enteral nutrition and even surgery in the most severe cases. Diet changes are often made based on the fact that the stomach is slow or non-functioning. Anything taken by mouth that would further slow down digestion is to be avoided. Foods high in fiber or fat will slow down the stomach. Vegetables, red meat, fried or fatty foods are all on the list of foods to avoid when you suffer from gastroparesis. Same goes for anything fortified with fiber. I find that staying away from any artificial sweeteners is also beneficial. When diagnosed with gastroparesis and a change in diet is your first step of treatment, it is important to consult with a dietician or nutritionist to make sure your body is receiving what it needs. They can also help develop meal plans in oder to eliminate the foods that may cause more intestinal distress due to gastroparesis. Everyone is different. What foods work for one individual, may not necessarily work for another. This process is often slow but necessary so you don’t continually make yourself sick by eating the wrong food for your body. For more information on GP diet guides, visit GPDA’s Gastroparesis Diet. If medications are not effective enough, the other options such as tube feeding and surgery for a gastric neurostimulator should be investigated. These are usually last resort options. Medications and diet modification is usually enough to control symptoms. Tube feeding is generally directed straight into the upper part of the intestine called the jejunum. It bypasses the malfunctioning stomach and is able to deliver nutrition. There are many different types of tubes from nasojejunal tubes (usually temporary to determine if you are able to handle tube feeds and is often placed endoscopically, under sedation by your GI or radiology), surgical tubes, endoscopically placed tubes (PEJ), and low profile tubes. 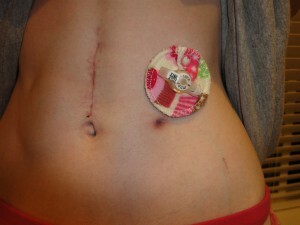 Low profile feeding tubes are generally placed only after the stoma site has fully healed from a PEJ. It is important that the tract between the stoma and intestine be fully formed before a button is placed. If that tract breaks down during the procedure, you might experience complications like me. Your doctor can discuss with you, the best tube for your situation. I have had all four types of tubes as seen below. The final stage in treatment is surgery. The current type of surgery performed is implantation of a gastric neurostimulator. A gastric neurostimulator, or stomach pacemaker, helps control nausea and vomiting by electrically stimulating nerves in the stomach. For some patients, the relief is instant while others take up to a year to notice any difference. It is not approved for improving gastric emptying but many hope that with time, they will notice a difference in that as well. The surgery for a neurostimulator is typically between 1 and 2 hours with a hospital stay of 2-3 days. Pain from the procedure is like any other open surgery. 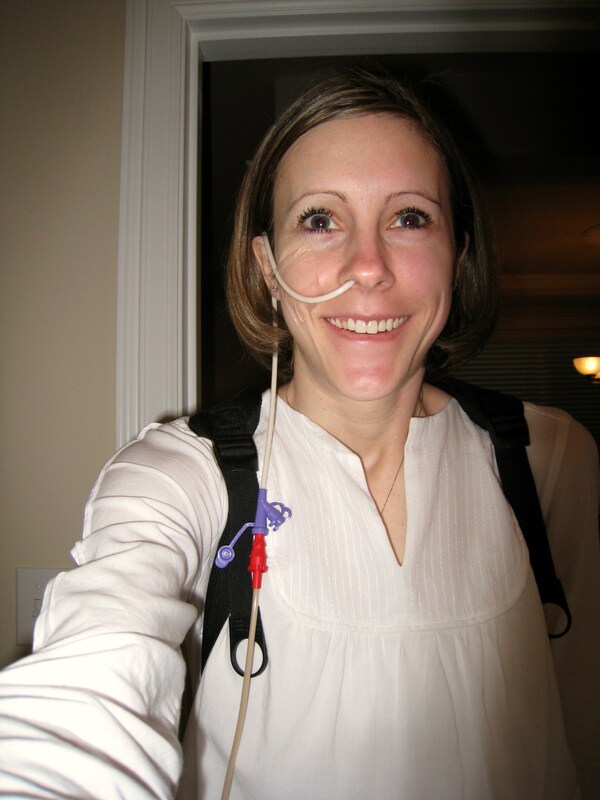 For me, pain was easily controlled through IV medication and at home with oral medication. I required only a week or so for recovery before I felt well enough to get out and do things. The device can be remotely accessed in your doctor’s office after the procedure. Adjustments are made individually and many adjustments are usually needed to fully take advantage of the device. There are positive advancements being made in the treatment of gastroparesis. Also known as Ulimorelin, this drug Tranzyme Pharma (TZP) has shown extremely positive results in controlled testing of diabetic gastroparesis. It has shown to be a potent prokinetic drug, significantly reducing nausea and vomiting while promoting gastric emptying. The furthest testing phase is seen with the IV delivered drug (TZP-101) but the oral (TZP-102) trials are not far behind. If this drug does what studies show it to be doing, it would be a very exciting bit of information for so many of us plagued by the disease of gastroparesis (idiopathic or otherwise) and the symptoms it produces. After much suffering and every test, gastro dr.
throwing in the towel and giving up. tried the poison meds Reglan, now back on stronger antibiotic therapy. chammomile tea. I am writing about my husband. all young people and even toddlers who have this condition. It is comforting to know you are not alone. How sad for all who are suffering so. Hello I am very happy to have found your website, it has taught me a lot about my disease. I am 32 years old and was diagnosed almost a year ago with GP. It was a long getting battle to get diagnosed. First, I was told I had acid reflux and they had put me on PPI’s (proton pump inhibitors) and acid reflux meds for years and then they said it was because of my endometreosis and I had that removed which I was still getting sick and having severe heartburn and vomiting and they did a complete hysterectomy at the age of 26. The doctors had no idea what was going on because I was still getting sick and losing weight. so many years went by because they started saying nothing was wrong with me and that it was all in my head that i was not really sick. After 10 years of consistently being told it was in my head i just let it go until i got tired of in and out of the emergency room for hydration and medication, I finally went to the gastontologst and said I was not leaving here without finding out what was wrong with me. The doctor sent me for the gastric emptying study which came back as having a 0 motility rate. I also have H-pylori and three ulcers. I weighed almost 155 lbs then and now i weigh 123 lbs in less than 6 months. they had placed a nj tube wich stayed in for 2 months and then reomved that one and placed a second nj tube in the other nostril. finally the doctors decided to place the peg tube, but the doctor who placed the peg tube obviously did not know what he was doing and placed the tube in the wrong spot and I aspirated in surgery and my lung collapsed. He walked away from me and said he was not fixing the peg tube and that I was getting another nj tube plus having the peg tube that did not work. This journey has been crazy, but i do have a question sometimes my stomach can handle some food and other days it does not? I don’t eat anything now except the Jevity 2.5 because i still have complications with eating and vomiting, but can it come and go? I have also experienced gastroparesis and I could only eat very little for weeks at a time. I didn’t know what was wrong with me. Then I found out that exposure to toxins from toxic mold can cause this. I took measures to get away from the mold in my house and car and now my digestion works fine, except if I get exposed to toxic mold again, then the symptoms come back. Dr. Richie Shoemaker is a leading expert in mold illness and he says a high percentage of people with mold illness have gastroparesis in comparison with the general population. You can see more information here: http://www.survivingmold.com/mold-symptoms. Hey everyone, I am so sorry you all share this horrible disease with me. I was diagnosed 9 years ago. Many many Doctors ended up telling me I am depressed and should get medicine for that. Out of desperation I referred myself. He listened, really listened and then the testing started. Yep, found H-pylori in my stool and pomply put me on Biaxon to kill the H-pylori……and me. I felt like death would not be a bad option. I started researching. Reading the side effects of the meds now…… all of them. You will be astonished at how many of them can cause gastroparesis. In my or our case eccelerate it so be very careful what medications you take. I now refuse them I’d they have the side-effect and ask for other meds. I am doing much better today and picked up weight again. I stay away from anything that cause stomach pain and discomfort, you learn the hard way unfortunately. I learned to chew my food very very well, and in doing so learned how to separate all fiber from the pulp and take it out of my mouth. If the fiber will not separate I do not swallow it but chew just to get my food “fix”. If I put something into my mouth and my brain tells me no, don’t do it I stop right there. Domperidome gave me breast milk and engored the so badly I could not take it anymore, it’s a horrible side effect. After my years I learned that acid blockers also contributed to GP , I weaned myself of them and now just use Zantac, Tums, Rolaid, Eno (Indian Stores) is where I buy that. It’s a effervescence and helps hugely with getting burps and winds to move. 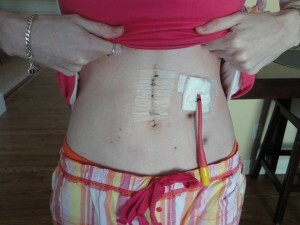 Today I am glad that I did not get the J-tube, or other procedures done. Protecting my stomach lining with full milk and protein shakes and powders and letting it heal bit by bit staying away from meds, with GP side effects, all fiber and stuff I can’t tolerate. If I think back at how dreadfully thin and sick and in pain I was, I have come a long way to being almost better. Just a couple of weeks ago I was bend over with a massive attack again, fortunately my new Gastrologist prescribed Bethanechol that helped me in three days to be comfortable again. Gosh it is awful to be in such pain you can’t even sit or stand or lay down because pain and nausea possess your every fiber and soul. Today I feel somewhat of a success story. Healed completely no, but much better yes. My prayers to you all. If you want and need support or just understanding you can email me at trixalanta@yahoo.com. The best to you. Feel better, you are part of a super strong family. Yes, gastroparesis is most definitely a day-to-day sort of situation. If it causes discomfort way more than not eating it, I would lean more towards not eating it. Anything you look to eat, most of the time I “recreational” eat (I call it that because I am eating very little, if at all, in a group restaurant situation. And sometimes you look at one of your old favorite food and think, is it worth it? Since you know what will happen when you do eat it. Again, is it worth it? I do it when we go out to eat (my husband and I or a big group). I think it makes everyone feel a little more comfortable when you do eat. While that’s not a good reason and everyone should just accept my situation with a feeding tube, a lot of people don’t and that’s OK because then I can talk about it with them. I am always open to any question in attempts at further spreading awareness. As far as the whole tube situation. I’ll tell you that is absolutely wrong and insulting to you when that happens. It happens a lot. Don’t get up. You will find the right doctor with some work on your part. It can be long and frustrating because you will learn more about it than they ever will. They don’t like that. But with time there too, some understanding doctor will be able to trace everything back to what you know is wrong.